The Nonin Deluxe 5 Point Rolling Stand, with an adjustable pole height, makes it easy to move with your Nonin pulse oximeter and serve more patients faster and better than ever. Nonin pulse oximeters are suited for both clinical and at-home applications. With an adjustable rolling stand, no matter where you’re at, you can easily turn your tabletop oximeter into a portable pulse oximeter. Nonin is known for producing high quality, non-invasive monitoring solutions that are used around the world. Their oximeters provide a wide variety of display indicators, so you can do more with less. To best see these indicators, the deluxe rolling stand was designed with an adjustable pole. Whether you’re sitting, standing or on-the-go, this deluxe rolling stand makes using and reading your pulse oximeter a breeze. When you’re searching for a stand that’s easy to roll in any direction, can reliably hold your oximeter and can store pulse oximeter accessories, look no further than the Deluxe 5 Point Rolling Stand. This adjustable pulse oximeter stand is guaranteed to hold your Oximeter, so you can rest assured it won’t fall off the stand while you’re in the midst of taking a reading. The 5 point rolling system allows for better balance and maneuverability, so you can easily move around a patient’s bed and from room-to-room when necessary. The deluxe stand also comes complete with a convenient basket that allows you to store and carry oximeter accessories, as well as other items your patients might need. Whether you need to carry wristbands and lanyards or you like to travel with extra cables and batteries, this adjustable pulse oximeter stand has got you covered. 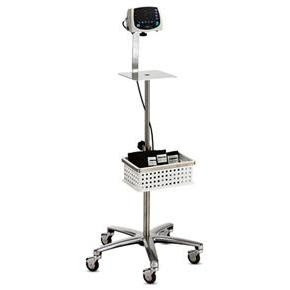 When you need to increase the portability of your pulse oximeter, and when you want to be able to transport extra supplies at the same time, search no further than the Nonin Deluxe 5 Point Rolling Stand w/ Adjustable pole Height from Concord Health Supply. Have a question? We can help! Contact Concord today for fast, friendly and knowledgeable customer service.